German solar battery creator sonnen are offering Australian households ‘free power’ through their sonnenFlat service in an order to bolster their foothold in the Australian market. Australian supplier and installer of solar products, Natural Solar, have been signed up to manage the offer for sonnen. They are also responsible for the supply and install of Tesla Powerwall 2’s, so they have plenty of experience in large scale product launches. Sonnen were launched 7 years ago in Wildpoldsried, Germany, and has been growing at a rapid pace since, including their foray into the Australian energy market in 2016. According to The Australian, sonnen have already gained a massive 13% of the Australian market share since entering it last year. They also sold over 11,000 battery units, ranging from $10,000 to $20,000 – and sonnen sees Australia as its ‘second most important’ market behind Germany – so they are willing to take a (potentially) loss leading strategy in order to gain greater market share for the medium-long term. The sonnenFlat energy tariff is for sonnenBatterie owners where you receive a guaranteed, prearranged amount of energy for a monthly fee. “In return, some of the energy stored in the sonnenBatterie will be used to assist in the stabilisation of the electricity grid” – according to the sonnenFlat site. “Looking at the Germany model for sonnenFlat … storage determines the amount of free electricity the owner is entitled to. The website also states that: “If a customer exceeds the amount based on their tier, then the owner starts to get charged only for electricity imported from the grid (not from power generated from your solar system and power utilised from your battery) at a rate significantly lower than standard retail electricity rates.” If you can get approved, this sounds like the sort of offer that will propel residential solar+storage from the ‘maybe’ category into the ‘definitely’ for those waiting for a chance to jump into the market. You can register your interest for the sonnenFlat energy tariff trial by visiting this page on the sonnen website. 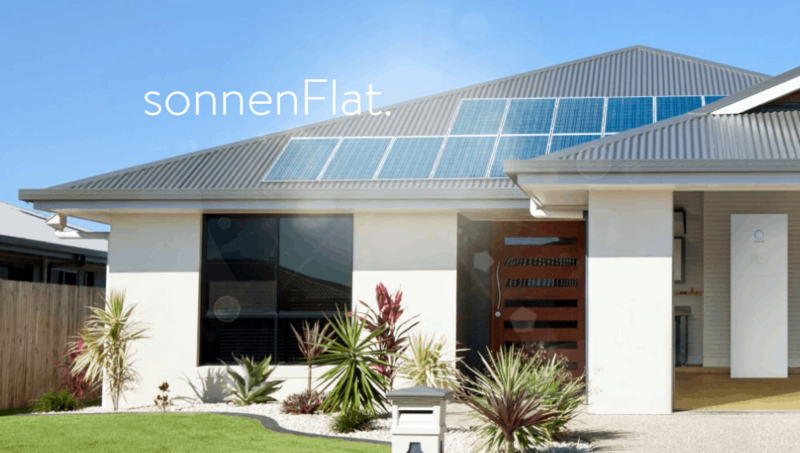 Sonnen have been in the news recently as they’re offering an alternative to the Tesla Solar Roof – the sonnen Solartile – click the link to learn more about how it will work in conjunction with the sonnenBatterie (and presumably the sonnenFlat tariff offer). It’s great to see a strong Tesla Powerwall competitor also offer alternatives to the Tesla roof tiles – the two in conjunction with their new ‘free’ energy tariff will undoubtedly ensure we see and hear a lot more about Sonnen in the future. 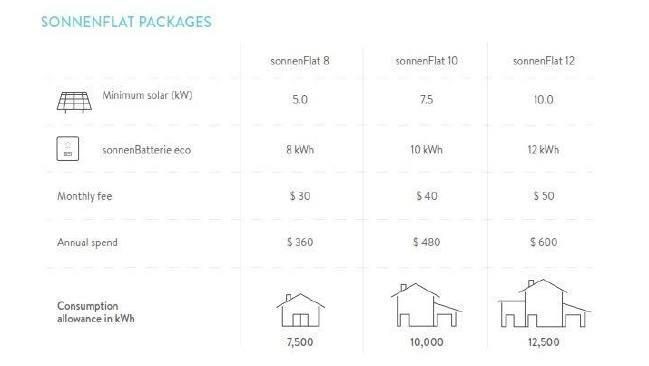 Here’s a breakdown of the sonnenFlat pricing structure – definitely starting to look like solar can be a real money saver! Shell buys Sonnen | Cheaper Solar Batteries? How much is the ‘low monthly fee’?